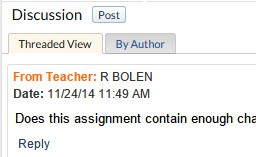 School Loop supports online discussions centered on an assignment, event, or news item. Discussions are also a feature of School Loop Groups. In all cases, participation in discussions is restricted to School Loop account holders. Users must be logged in to view and make posts in discussions. Discussions are also restricted by who can view a given assignment, event, or news post as well as by membership in groups. For example, when a teacher posts an assignment to her 3rd-period Economics class, only the students in that class will be able to see that assignment and participate in its associated discussion. 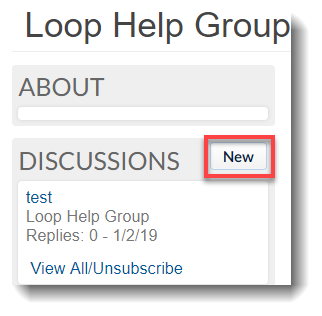 For districts that have purchased School Loop's Unification feature, it's possible to form cross-district groups, so discussion among members from different schools and the district office is possible. Otherwise, discussions are also restricted to members of the same school. All assignments automatically include a discussion among the teacher and all the students assigned the work. This enables students to seek clarification on assignments and to provide help for their classmates. 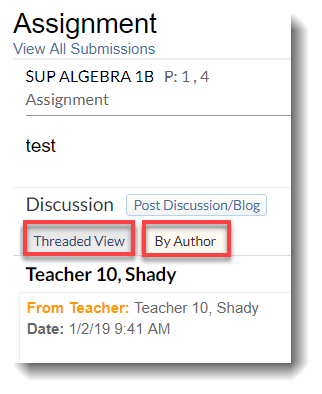 All discussions for current assignments appear on the teacher's dashboard under the heading "Student Discussions" Teachers have the right to edit and delete posts associated with their assignments. Teachers can also grade discussion posts on the Assignment Scoresheet. Assignment discussions can be sorted by author. 2. Click the View By Author link to see all posts grouped by the author. The link now changes to View Threaded. 3. Click the link again to return to the traditional threaded view of discussions. This can be accessed by going to your group under Groups on the top right part of your page. The topics of running discussions appear on the My Portal page of all group members, and all posts are emailed to all members. Members can opt out of the email from the Group, or inside the email. When publishing news or events, the author can check a box to enable a discussion (located near the bottom of the form). Be cautious with this feature if the news or event is published broadly (say to all students and parents). Note: News and Events posted on the school website with discussion enabled are not open to participation by all visitors. Only account holders who are logged in will be able to see and participate in any discussions. To access Interventions, click on Student Records under the Toolbox menu -> choose a student -> Interventions tab. All Student Records contain an Intervention discussion among all the teachers of a student. These discussions are only viewable by certified school personnel. Once created, all discussions work similarly. The person who starts the discussion can edit or delete any post. People in the discussion can reply to any post, and posts are nested so readers can follow the conversation. In addition, people in the discussion can attach a file or a link. Every member has a My Portal page, and all active discussions for a member appear in a special box on My Portal. Discussions also appear in other places. They are listed in the Groups homepage, assignment discussions are on a teacher's portal homepage, and Interventions appear on the Student Record of the appropriate student. Click the discussion title, and find a post that you would like to reply to. You can reply to the original post or any individual reply. If you created the discussion, you may edit or delete any post. When you edit someone else's post, your name will appear as the new publisher of the post. You can delete an entire discussion by deleting the top post. If you delete an individual reply in a discussion, all replies to that post will also be deleted. Deleting assignments, events and notes will naturally delete any associated discussion.